Overview: Luxury self catering accommodation. Fully equipped, serviced and airconditioned. Only 5 minute walk to the beach, shops, restaurants, movies and lively pubs. DSTV with 7 live TV channels. Secure parking. Fully equipped outdoor lapa entertainment and braai facility. Ideal for large and small families, golfing groups, sporting participants, touring parties and business men. Overview: Boulevard 44 Boutique Hotel and Spa is an upmarket 4 star hotel nestled in the rolling hills of Umhlali on Kwa Zulu Natal’s North Coast. It is 3 kilometres away from the vibrant holiday mecca of Ballito and 10 minutes drive from the new King Shaka International Airport. A truly South African “country” experience awaits the discerning executive traveller or leisure guest, and with its’ sense of tranquillity and natural beauty, this venue is ideal for romantic weddings, private functions or conferences. Overview: Shangri-La Luxury Guest House. A Four Star Jewel on Salmon Bay. 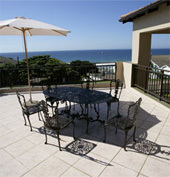 Nestled between the fields of Natal ''Green Gold,'' golden beaches and the warm Indian Ocean lays the village of Ballito. Shangri-La is a place in a setting so special, it speaks to your soul. The Guesthouse is situated on the fringe of the breaking waves with breath-taking sea views, and spotting the Whales and Bottlenose dolphins feeding along the shores. The luxury Double rooms, furnished to an exceptionally comfortable high standard, walks out on their own veranda, and are well equipped with: Dstv, Mini bar, Coffee/Tea facilities, Internet, Aircons, Hairdryers. Shangri-La is easily accesible, 60 Mtres from the beach, and within walking distance of restaurants; coffee-shops; banks; and shopping centre. We are 40 Km. from Durban and 15 Km. from the new International Airport - King Shaka's Airport.